Sailors all along the Northeast coast have been attracted to Key West Race Week since its beginning in 1988. The contingent of racers that migrates south is always tough, with many top contenders. Many have begun planning their ideal winter vacation and are sorting out the logistics for Quantum Key West Race Week 2015. They’ll join programs from all over the country and around the world as they head to the Southernmost point in the continental U.S. for a Key West getaway and the 28th edition of this iconic event. There’s something for everyone at Race Week. With boats ranging from 22 to 72 feet and professional and amateur sailors competing together, there are all types of boats and sailors celebrating the New Year and sailing season in the beautiful waters off Key West. 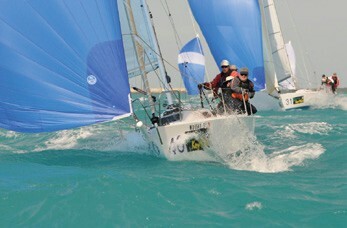 Key West Race Week is a unique regatta with five full days of racing and renowned shoreside fun. The wind is dependable and the sunshine is always warm which draws the crowd of sailors to Key West each January. For many “snowbirds,” the whole family comes for a vacation. Key West offers plenty of activities for those not out on the racecourse during the day. From water adventures to the Conch Tour Train, museums and beaches, there is plenty to do. The diversity of the nightlife allows the young and old to find the right spot – Duval Street alone has everything from kid-friendly American fare to local Caribbean flavor. The shoreside Race Week venue at Kelly’s Caribbean, between Caroline and Whitehead Streets, has proven to be successful the past few years. This intimate setting is a great place to stop for an after-race drink and collect your trophy before having dinner with the crew. Just steps off Duval Street, this central location is a great meeting spot as sailors get off the water. It’s here that Race Week conducts daily awards presentations for all classes, with some receiving both Open and Corinthian trophies. The coveted Quantum Sails Boat of the Week trophy is awarded at the end of the week, while a Boat of the Day winner is recognized each night. Key West is a unique setting that offers a variety of opportunities for sailors to create their perfect winter escape. Sign up today and begin planning your winter vacation. Quantum Key West Race Week is a quality regatta not to miss. For more information on registering and fleet news, visit premiere-racing.com. Kelly Gorman is the Event Manager at Premiere Racing, Inc. in Marblehead, MA, the organizer of Quantum Key West Race Week.